If you want to spend a day exploring one of the rare volcanic marvels of Australia, then a visit to the Undara Lava Tubes should be high on your list of “must do” experiences. They are one of the true wonders of Australia and reputedly the longest lava tubes in the world. Located in the outback four hours’ drive south-west of Cairns via the Atherton Tablelands, the Undara Experience offer a range of unusual and memorable experiences: bushwalks through the tropical savannah countryside, conducted tours of the huge caverns which drop down into the lava flow tunnels, guided night-time inspections of the wildlife that lives in the caves and helicopter flights to see the dark scars across the landscape created by the lava flows. Mix things up and time your visit with the Outback Rock and Blues Festival in April or Opera in the Outback every October, in the purpose-designed outdoor amphitheatre, Ooramin Place. And for travellers seeking their fortune, lying just to the west of Undara is Mount Surprise Gems, where you can hire equipment, learn the rudiments of gem-fossicking and lapidary, and head to O’Brien’s Creek to find your own gleaming piece of topaz or agate. But what exactly is a lava tube? Put simply, when a volcano erupts it disgorges oceans of lava which flow across the land. If that lava flows into a valley it becomes a river of molten rock. The best way to understand this is to imagine a lava flow (which is just red-hot basalt) cooling and becoming solid on the outside while the inside is still molten and keeps flowing. The Undara Lava Tubes were created about 190,000 years ago when a staggering 23 cubic kilometres of lava flowed into a river bed and kept flowing for 160km, making it the world’s longest lava flow from a single volcano. Huge caves, some over 21m wide and up to 10m high, have formed in places along the tubes. They are never dark because they are gaping holes which can be entered by visitors accompanied by tour guides. The experience is genuinely unforgettable. There’s a number of different accommodation options at Undara Experience but the most popular is offered in turn-of-the-century Queensland Railways carriages. The original fittings are still intact, the bathroom is a modified version of an old railway restroom and the bed is large and comfortable. When it comes to food and drink, Undara offers a genuine outback experience. The evening meal is either steak, fish from the Gulf of Carpentaria, sausages from Georgetown or kangaroo. There is a dessert appropriately named Chocolate Volcano. 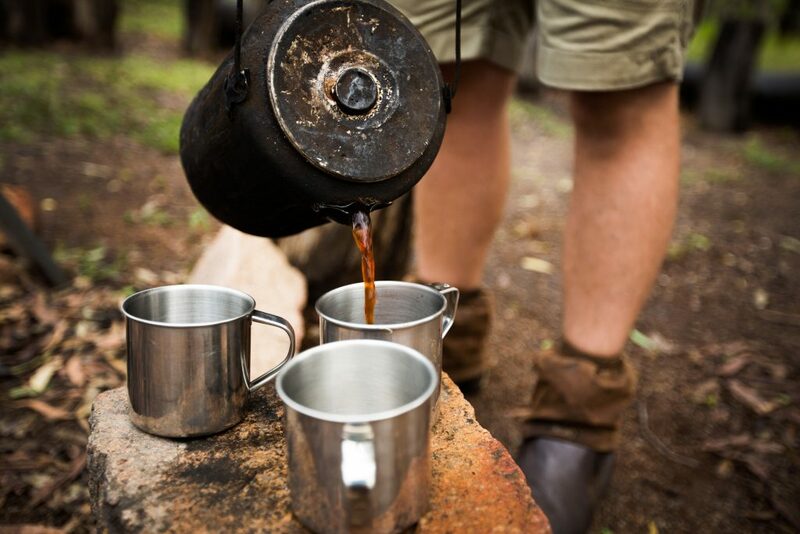 Visit the bar in a refurbished railway carriage and in the morning, the Ringers’ Camp Bush Breakfast is cooked over an open fire. Tea is boiled in a billy (a tin can) and seating is arranged so everyone sits around the fire. Many breakfast aficionados insist that the bacon, with a hint of smoke and eucalypt, is the best they’ve ever eaten. The Undara Lava Tubes can be only be inspected on guided tours which are organised by the eco-tourism operator, Undara Experience.